With the rapid development of modern industry, heat exchanger equipments are used for a long time. It is no doubt that a lot of fouling such as coking, oil dirt, scale, sediment, polymer, corrosion, mold and others will be produced. And the heat exchanger plate is the core component of the heat exchanger, if the cleaning methods are not scientific, it will directly cause various economic losses, and even malignant accidents may be happened. Cleaning heat exchanger equipments becomes an important indispensable part in the industrial production; therefore it is preferable for you to choose professional cleaning company. Hofmann having trained maintenance engineers tries its best to develop environmental protection cleaning technologies, combined with years of service experiences, to provide quality services for you. 1. Preliminary Check: Establishing the archive information about stainless steel sheets and gaskets used in the high temperature, corrosive medium, deciding and analyzing preliminary the corrosion of the plates and the aging of gaskets, then we can make a reasonable cleaning program. 2. Dismantling gasket: During dismantling gaskets on each plane carefully, we will take appropriate protective measures to prevent gaskets damaged. 3. Cleaning plate: We will put the plates in professional cleaning devices. In the whole process of cleaning, the strict control procedures ensure plates cleaning thoroughly. We have formulated different cleaning solutions for different conditions. In order to remove loose scaling and fouling, a high-pressure water cleaning and brushed hand scrub are necessary. In the case to severe fouling or scaling, a high-pressure steam clean will follow. 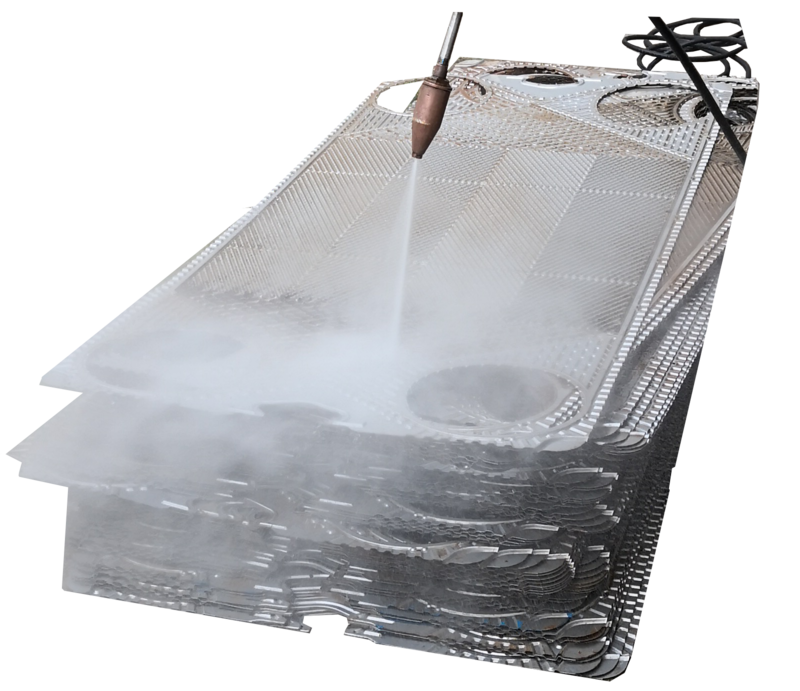 For rigid scaling no dissolved in acidic solutions, powder-blasting is used along with high-pressure steam or water. The majority of plates are bathed in a proprietary series of chemicals depending on the heat exchanger application. A carefully selected process of altering chemicals, temperatures, and agitation assures the most effective cleansing process. Gaskets glued with two-component epoxy are submerged in liquid nitrogen to break the bond and eradicate stubborn glue. And this preferred method is also used for other types of obstinate scaling. 4. Penetrant examination: By using dye penetration examination to check plates after our cleaning, to ensure there are not cracks, corrosion points and other defects on the plates as new products. 5. Recleaning: After dye penetrant testing, we would like to clean them again, and then dry them thoroughly by compress air to ensure that the surfaces look bright and clean as new products. 6. Surface checking: Check the cleaned plates again and put in order, wait for the follow-up work.